Enter Laila Nur, stage center. If you missed her Ignite at CMC-North, you can go watch it here. I can think of no way to recreate in text her impressive sense of timing and delivery that was displayed at Shadow Con so I shall not try. My sketchnotes feel barren compared to her talk–likely because I was laughing too much to get things down–but there are a few things that really sparked with me. The gap between student language and classroom language needs a bridge if we’re ever going to get kids invested and interested and committed to all the mathematical thinking we want them to do. The words used to talk about mathy things need to make sense to them first and then, based on desires for precision and whatnot, we can start into to the mathematical vernacular. Tossing out words prior to students feeling a need for them feels a bit like setting loose will-o-wisps that just lead students deeper into the belief that mathematics should be seen but not understood. Laila’s advocacy of using humor to get kids tackling math language is a great bridge to use. I’m wonder, though, if I’m missing a plural here. Humor is a bridge. So is using student interests. So is using puzzles to perplex. Everyone out there with a classroom has a teaching practice of their own that needs to align to their personal beliefs and personality style. How do you plan on getting your students talking math in a way that jives with how you teach? Laila’s note that her use of humor is not a comedy routine nor a one time thing should really be highlighted in my notes. 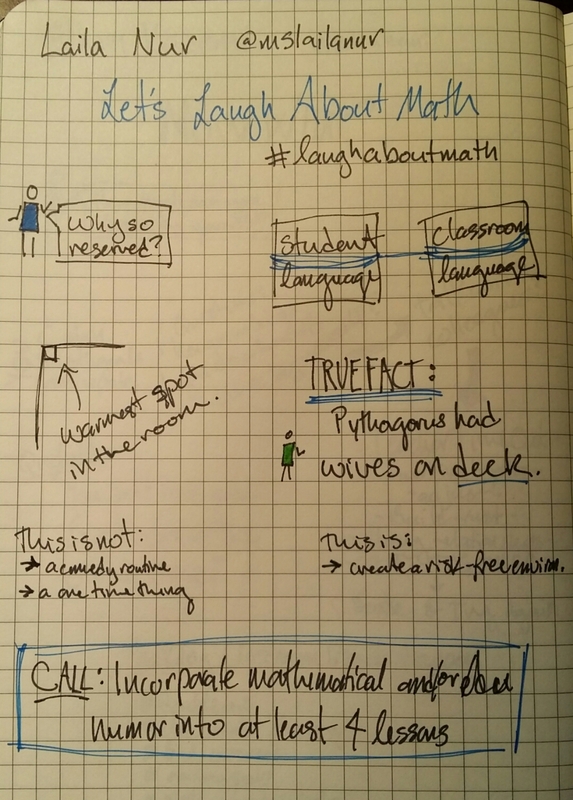 I suspect for those students not used to laughing in math class–at the math at least–it took time to become part of the classroom culture. Thinking back on my own practice when I implemented my What’s the Question? warm up routine it took weeks for students to really get into it. To understand that they could speak without worry of criticism. To show me their humor or their diligence or their creative way of thinking. Thinking back on this talk reminds me that while we’re in that room to teach math, we’re also in that room to help a group of novice adults learn how to speak and reason all while being who they are and not simply miniature versions of someone they think they should be. And for anyone planning on meeting Laila’s call to action through the use of cat pictures, please post them to share the love. I should have put little question marks all over the place because it is a rare day that I meet anyone as interested in the thinking of others as Kristin Gray. If we could bottle and sell her curiosity, we would all be rich. But since that bit of magic is impossible as I can’t even get a lumos to work, let’s talk about the power of the conversations Kristin describes and how we as teachers benefit from them. I’ve been phrasing these posts kinda from an anonymous teacher’s perspective because the narrative arc presented by Shadow Con worked well told from that POV. 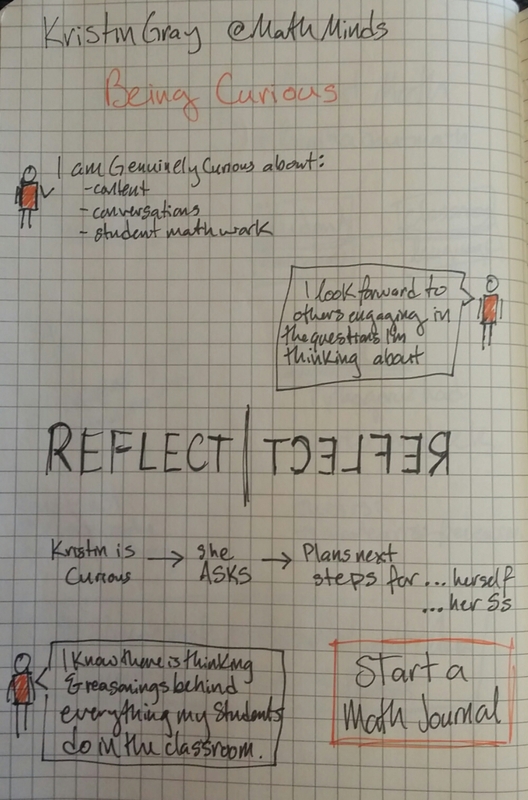 Reflecting on Kristin’s talk, however, made me see a lot of my own journey as a teacher so true confessions time. As part of my pre-service program I spent a quarter in a middle school classroom 1-2 days per week. At the time I recall thinking that the students were great, but the math just didn’t excite me (ratios are kid stuff, right?) so I was excited that my actual student teaching was at a high school. Both experiences matched how I was taught in secondary: homework review and questions, lecture, including three examples, followed by time for students to get started on the assignment while I wondered around. Maybe I had curiosity, but during my first year teaching I was focused on survival and following the lesson plans I’d been handed while figuring out how to build positive relationships with my students. Two and a half years of this and I was ready to throw my hat in. I wish I had met someone like Kristin in that first year or in my pre-service days, but I’m also not sure I would have been ready to hear it then. In year three I was, and I realize now that it was curiosity sparked by teaching blogs that kept me in the classroom. I was curious how these other teachers were questioning their students. I was curious at how much they reflected on their own practice in the open forum of the internet. I was curious what my students would do if I tried some of the not-out-of-the-textbook problems described. When my love of mathematics failed me in the classroom, curiosity took me in. The quote in the bottom left, “I know there is thinking and reasoning behind everything my students do in the classroom,” is one that I could have said in year one but that I didn’t grok until much later. Things like graphing stories and books like What’s Math Got to Do with It? and standards based grading and a really tough algebra 1 class all came into my life around the same time and shifted my thinking about my teaching practice. The content will always be a great love, but the conversations and discussions over student work (with students and teachers both) are true joys and they keep me wanting to teach. I wish I could go back in time and shake my pre-service self in that middle school classroom into being curious about all the interesting mathematical thoughts happening in the heads of those kids. I’ve been thinking a lot about ratios of late due to a project and when I look at student work and think about the conversations to be had with those kids I want to just go sit in a middle school classroom and listen. The further I get the more interested in K-8 mathematics I become, though I still say it’ll be years before I know enough math to teach elementary students. So thank you, Kristin, for helping me reflect on my own journey as a teacher and being such a passionate advocate for genuine curiosity. I love your call to action for folks to keep a math journal. For those who like a bit of history, a few hundred years ago such journals were called Commonplace Books. Ever since I read about them I’ve been keeping a Commonplace book of interesting quotes I run across. Keeping one for the mathematics I’m curious about and the questions students raise that make me stop and wonder will be a great addition. Hopefully next NCTM we can share some favorite entries into our books. This entry was posted in #MTBoS, Prof. Development, SketchNotes. Bookmark the permalink.